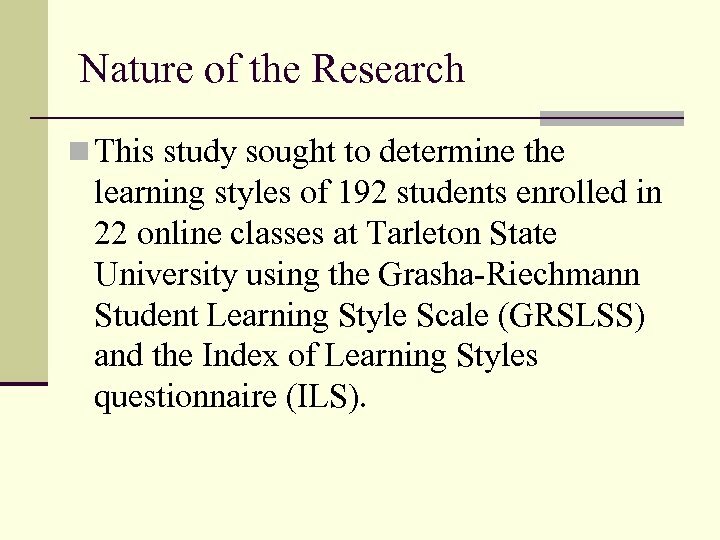 Nature of the Research n This study sought to determine the learning styles of 192 students enrolled in 22 online classes at Tarleton State University using the Grasha-Riechmann Student Learning Style Scale (GRSLSS) and the Index of Learning Styles questionnaire (ILS). Research Participants n A population size of 1100 students and 75 instructors were invited to participate in the study. 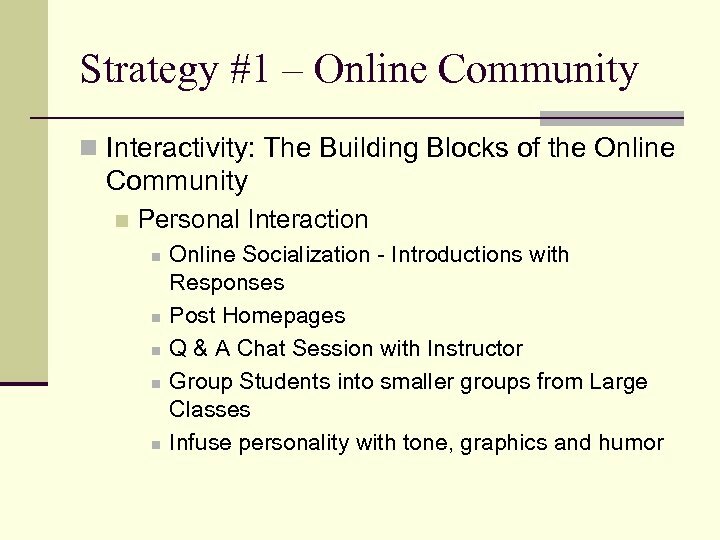 However, the sample size was smaller as only 29% of online instructors agreed to have their students participate. 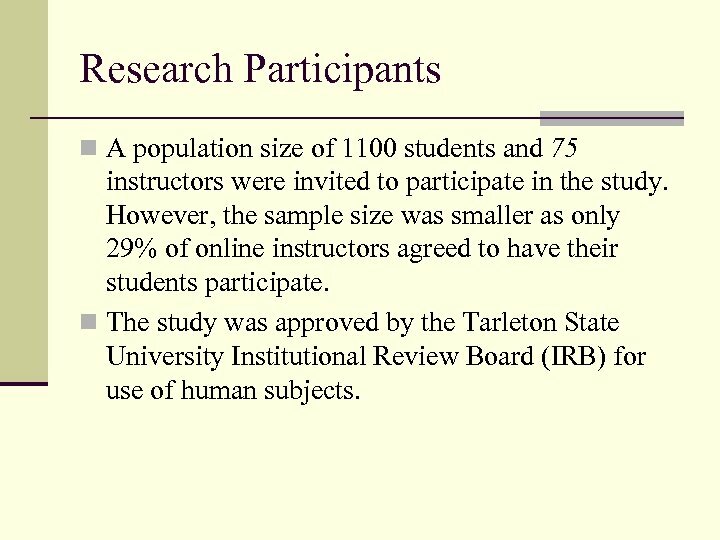 n The study was approved by the Tarleton State University Institutional Review Board (IRB) for use of human subjects. 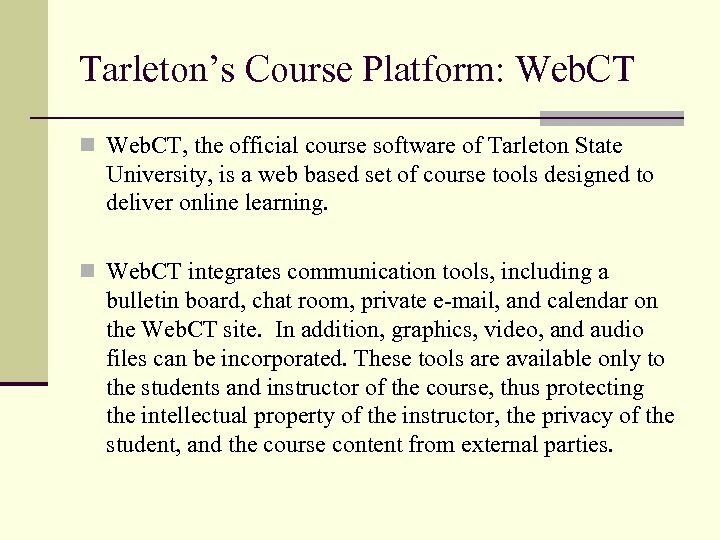 Tarleton’s Course Platform: Web. CT n Web. 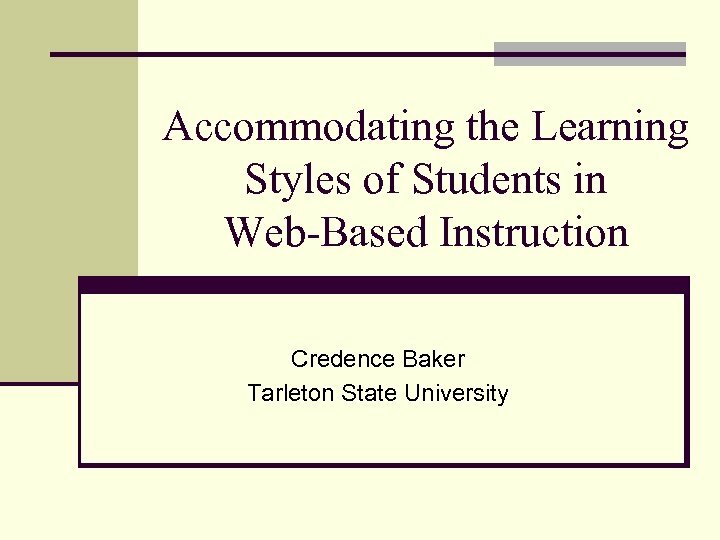 CT, the official course software of Tarleton State University, is a web based set of course tools designed to deliver online learning. 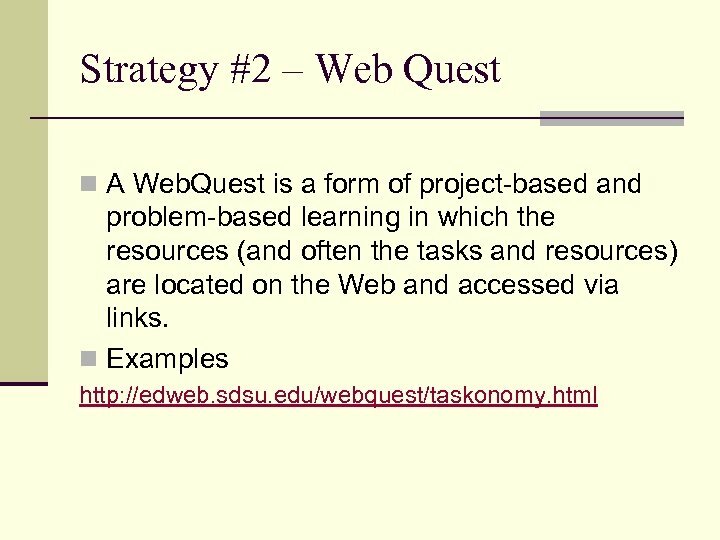 n Web. 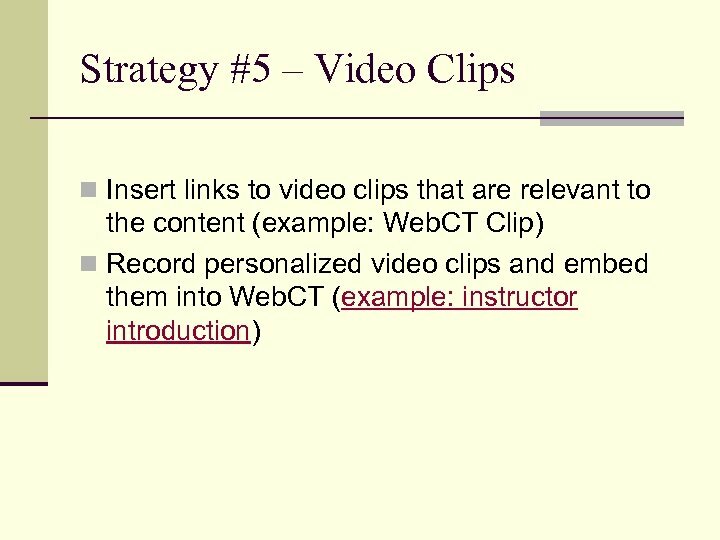 CT integrates communication tools, including a bulletin board, chat room, private e-mail, and calendar on the Web. CT site. 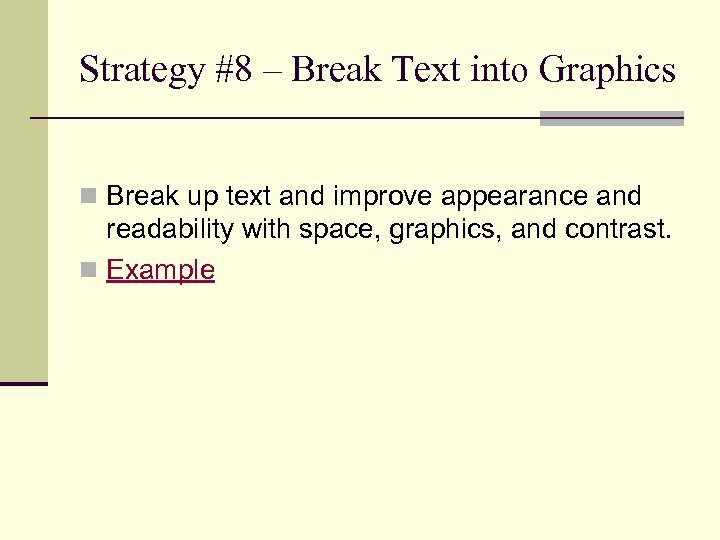 In addition, graphics, video, and audio files can be incorporated. 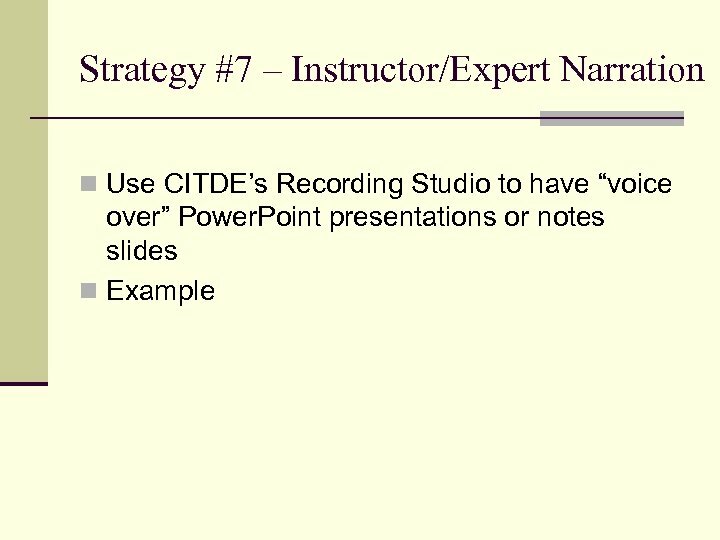 These tools are available only to the students and instructor of the course, thus protecting the intellectual property of the instructor, the privacy of the student, and the course content from external parties. 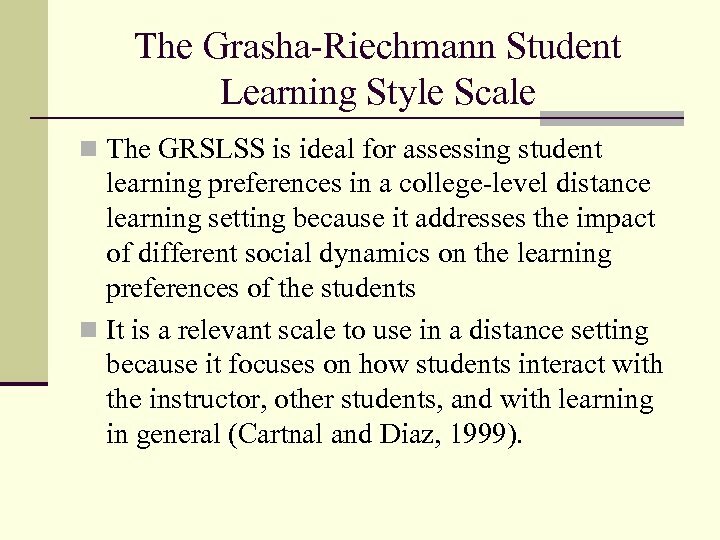 The Grasha-Riechmann Student Learning Style Scale n The GRSLSS is ideal for assessing student learning preferences in a college-level distance learning setting because it addresses the impact of different social dynamics on the learning preferences of the students n It is a relevant scale to use in a distance setting because it focuses on how students interact with the instructor, other students, and with learning in general (Cartnal and Diaz, 1999). 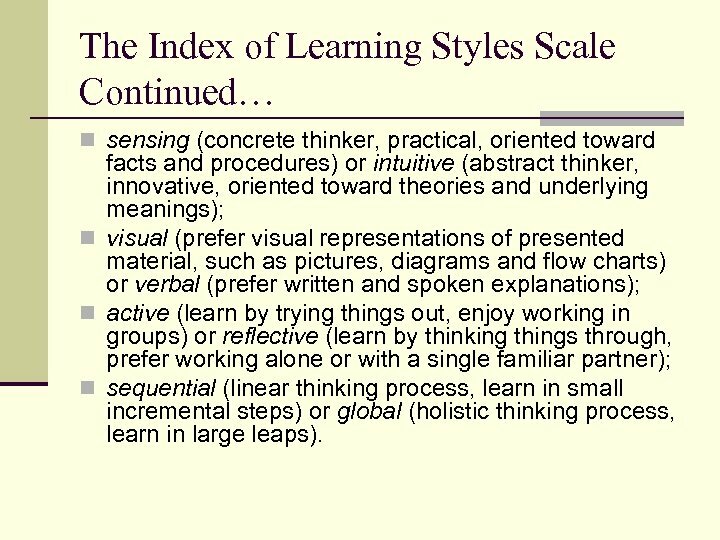 The Index of Learning Styles Scale Continued… n sensing (concrete thinker, practical, oriented toward facts and procedures) or intuitive (abstract thinker, innovative, oriented toward theories and underlying meanings); n visual (prefer visual representations of presented material, such as pictures, diagrams and flow charts) or verbal (prefer written and spoken explanations); n active (learn by trying things out, enjoy working in groups) or reflective (learn by thinking things through, prefer working alone or with a single familiar partner); n sequential (linear thinking process, learn in small incremental steps) or global (holistic thinking process, learn in large leaps). 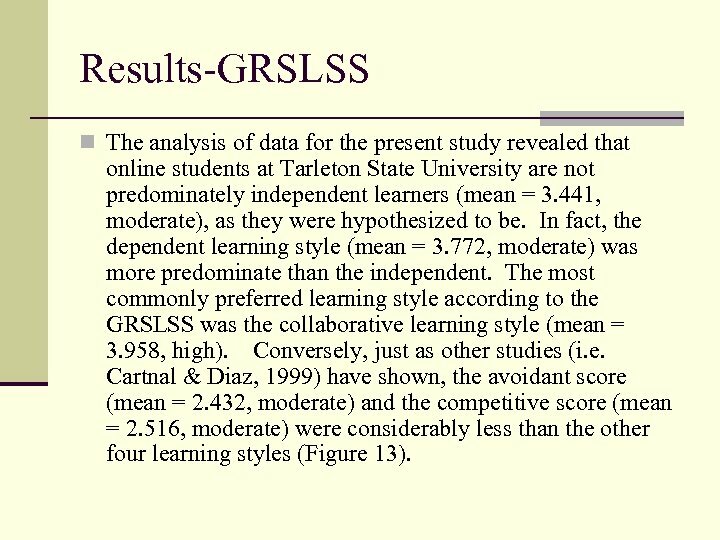 Results-GRSLSS n The analysis of data for the present study revealed that online students at Tarleton State University are not predominately independent learners (mean = 3. 441, moderate), as they were hypothesized to be. 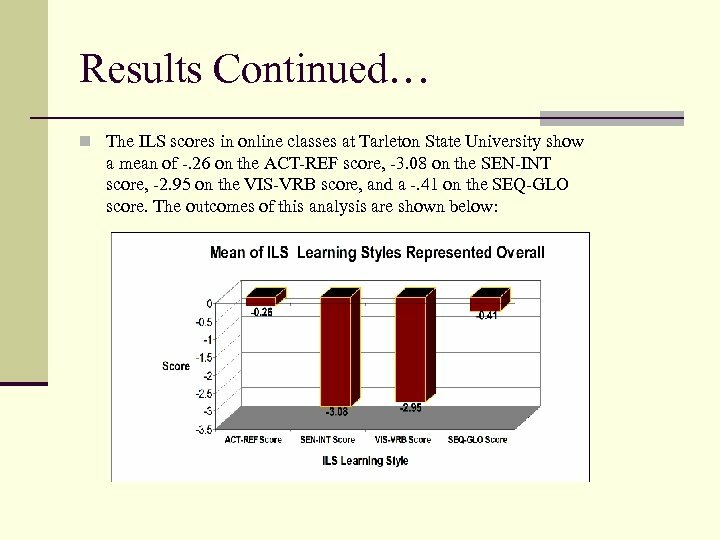 In fact, the dependent learning style (mean = 3. 772, moderate) was more predominate than the independent. 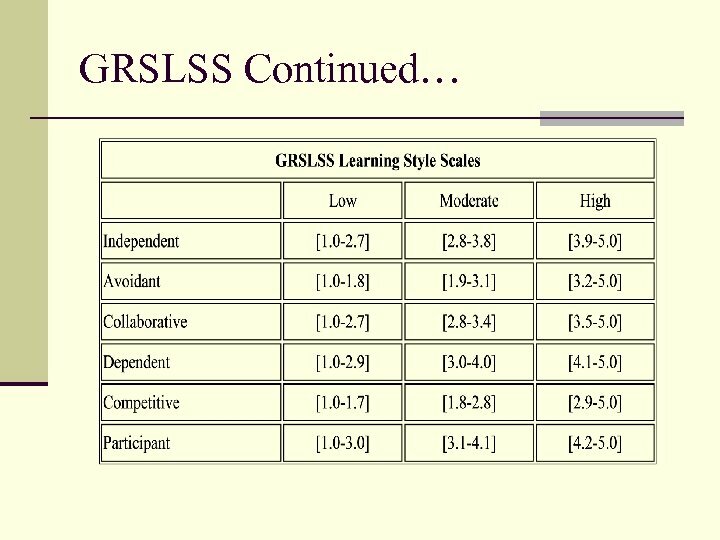 The most commonly preferred learning style according to the GRSLSS was the collaborative learning style (mean = 3. 958, high). 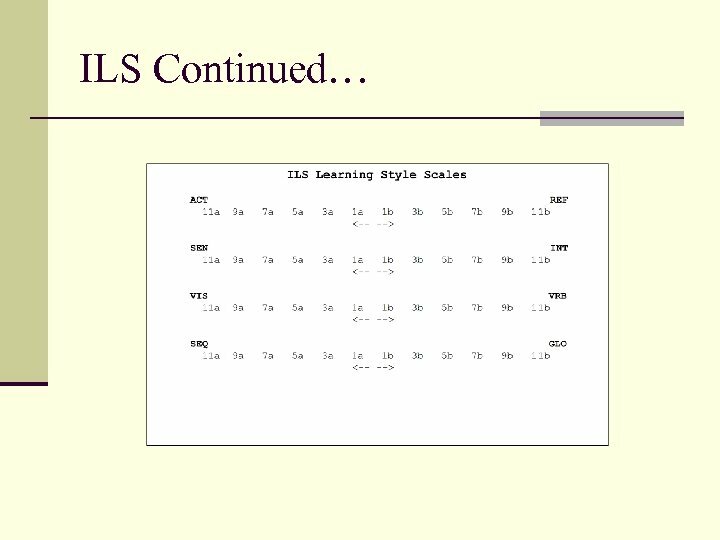 Conversely, just as other studies (i. e. Cartnal & Diaz, 1999) have shown, the avoidant score (mean = 2. 432, moderate) and the competitive score (mean = 2. 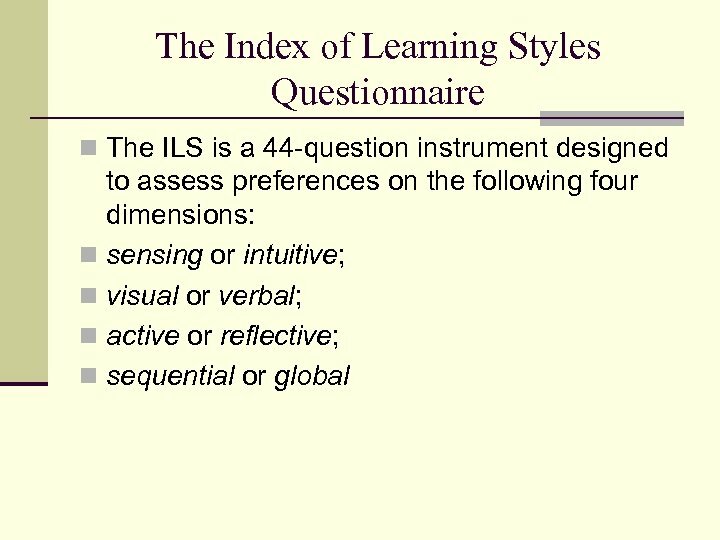 516, moderate) were considerably less than the other four learning styles (Figure 13). 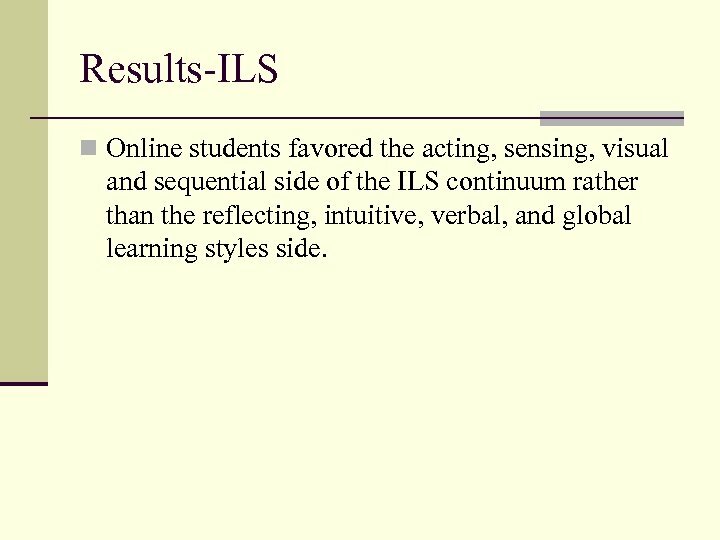 Results-ILS n Online students favored the acting, sensing, visual and sequential side of the ILS continuum rather than the reflecting, intuitive, verbal, and global learning styles side. 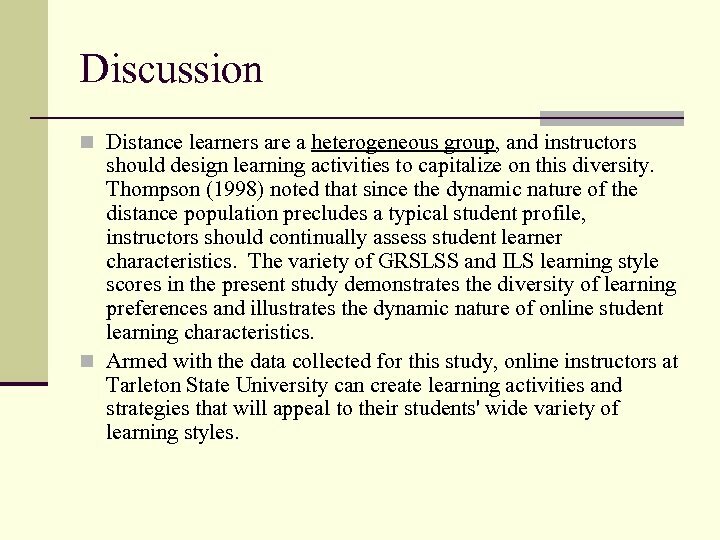 Discussion n Distance learners are a heterogeneous group, and instructors should design learning activities to capitalize on this diversity. 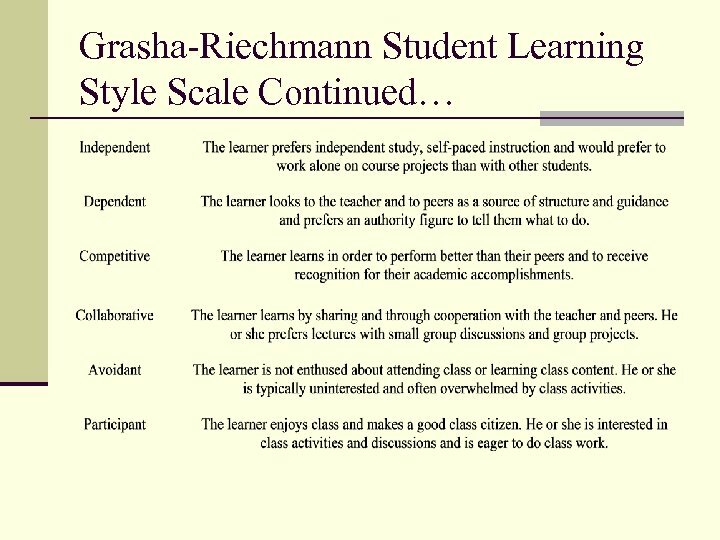 Thompson (1998) noted that since the dynamic nature of the distance population precludes a typical student profile, instructors should continually assess student learner characteristics. 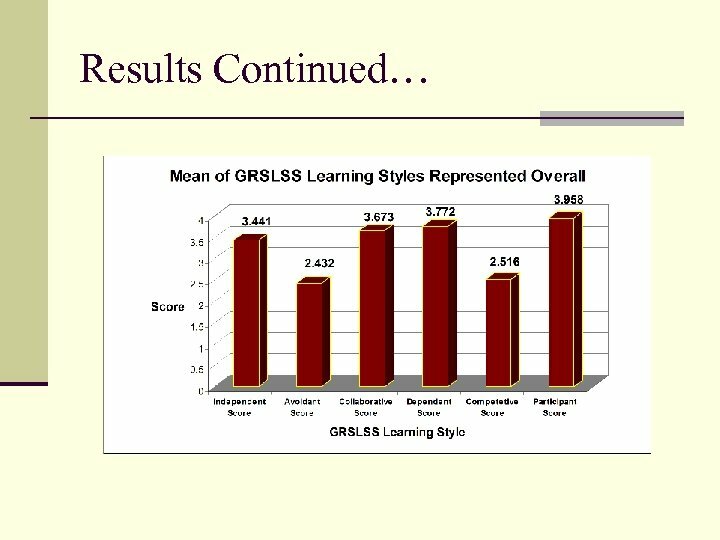 The variety of GRSLSS and ILS learning style scores in the present study demonstrates the diversity of learning preferences and illustrates the dynamic nature of online student learning characteristics. 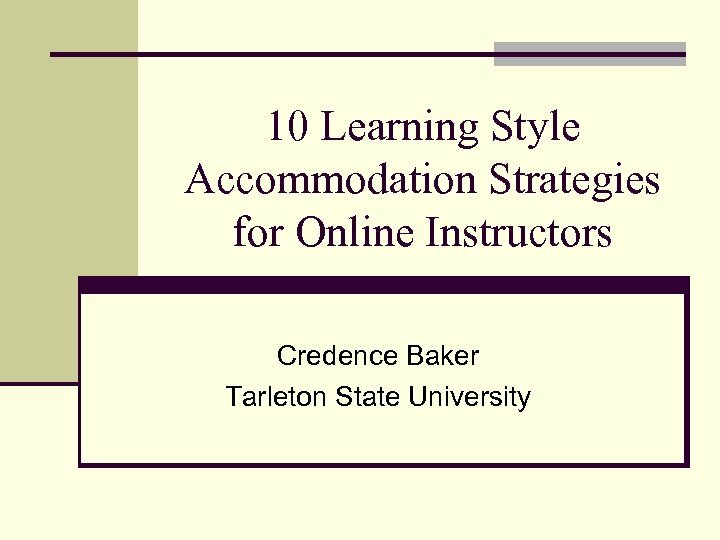 n Armed with the data collected for this study, online instructors at Tarleton State University can create learning activities and strategies that will appeal to their students' wide variety of learning styles. 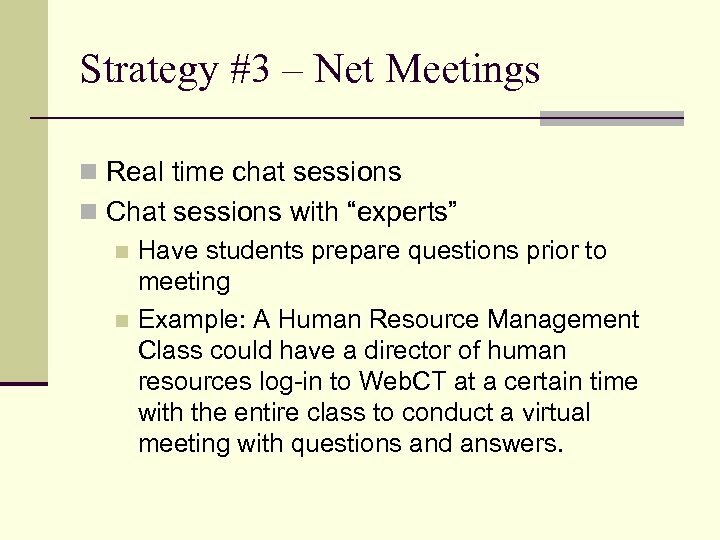 Strategy #3 – Net Meetings n Real time chat sessions n Chat sessions with “experts” n Have students prepare questions prior to meeting n Example: A Human Resource Management Class could have a director of human resources log-in to Web. 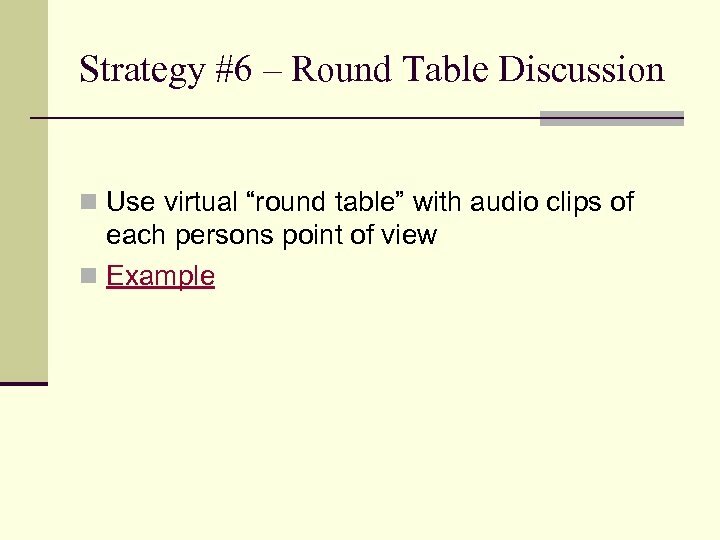 CT at a certain time with the entire class to conduct a virtual meeting with questions and answers. 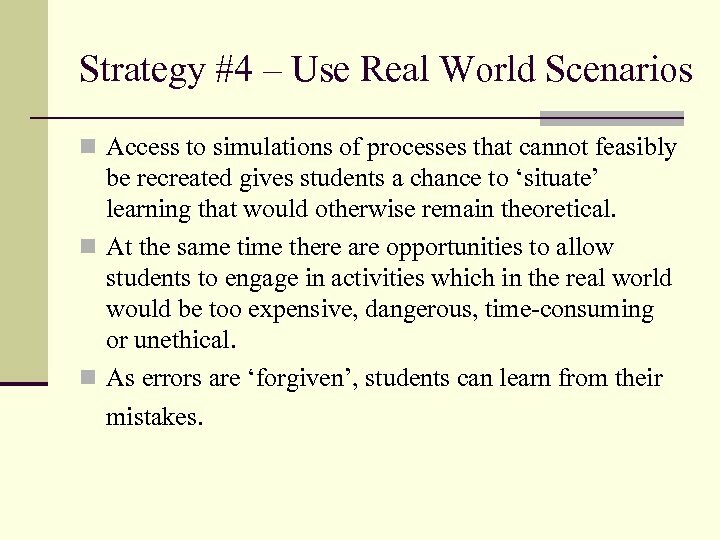 Strategy #4 – Use Real World Scenarios n Access to simulations of processes that cannot feasibly be recreated gives students a chance to ‘situate’ learning that would otherwise remain theoretical. 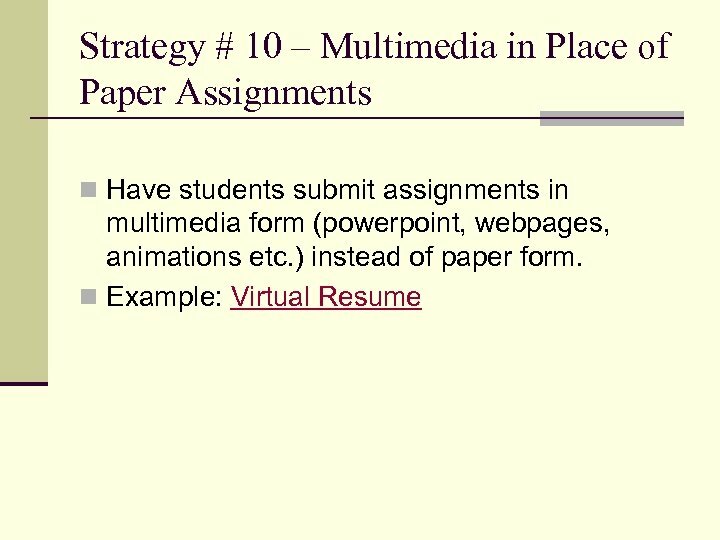 n At the same time there are opportunities to allow students to engage in activities which in the real world would be too expensive, dangerous, time-consuming or unethical. 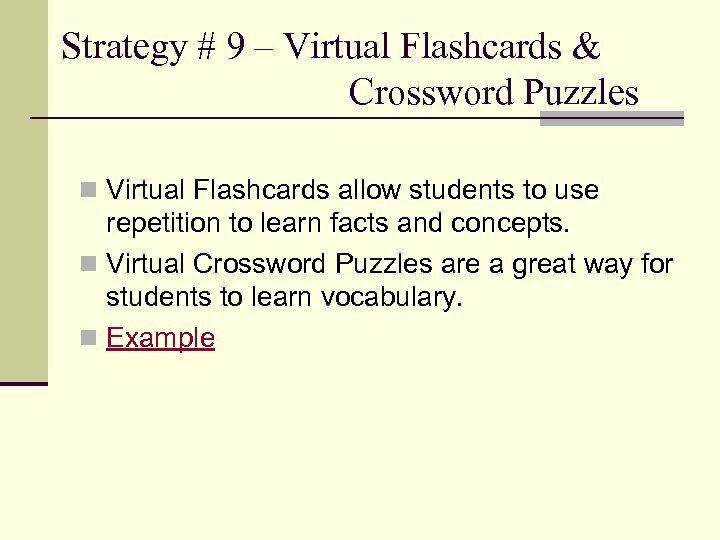 n As errors are ‘forgiven’, students can learn from their mistakes.